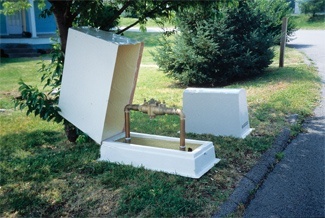 Backflow preventer enclosures come in a variety of materials all with various levels of protection. However, for backflow prevention devices larger than 3", the two main types are aluminum and fiberglass enclosures. Obviously, we know quite a bit about aluminum enclosures and could tell you about how they're made, why we make them that way and much more. 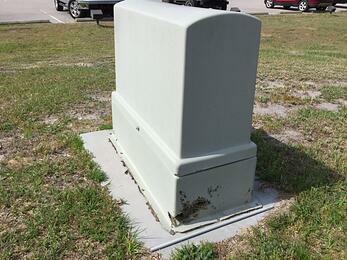 Safe-T-Cover also has plenty of knowledge on fiberglass enclosures as well. Protection: A fiberglass shelter with locking mechanism provides protection from thieves, vandals and accidents. Spray foam insulation provides frost protection and a wall mounted heater can provide freeze protection to the pipes inside the box. Sizes: one leading manufacturer sells models from 20" x 6.5" x 22" to 83" x 26" x 55"
Options: There are many manufacturers to choose from and some offer options such as using different colored fiberglass. 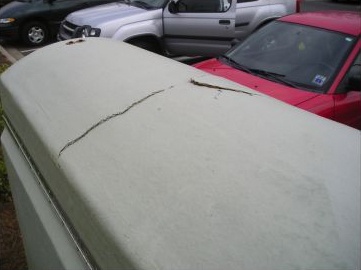 Custom penetrations and panels are not common because of how easily cracked or splintered fiberglass is. 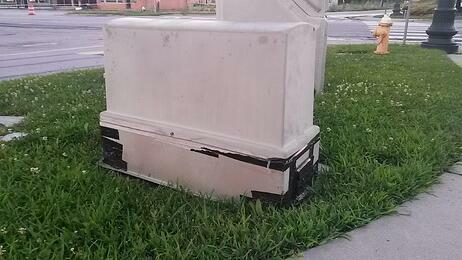 Unlike aluminum or steel boxes, fiberglass does not corrode or rust. Equipment that uses chemicals that may cause corrosion such as hydrochloric acid or sodium hydroxide. Fiberglass is, by it's nature, resistant to these materials. Other enclosures would need additional treatments and may still be unreliable in in a caustic environment. Fiberglass building manufacturers typically machine their products to be in very few pieces, and often in just one piece. That makes the covers very easy to install. The process is quick and easy as long as nothing was damaged in transit. Fiberglass is a pretty lightweight material. This comes with a couple different perks. First of all, the shipping weight will be lighter than some other products because of this. The other nice thing about lightweight materials is that they allow easy access once installed. A fiberglass shelter can be fitted with a liftable roof or lid for equipment maintenance or repairs. 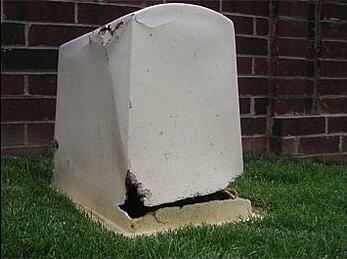 One of the common concerns with outdoor fiberglass covers is how easily they can develop holes. Weekly landscaping can quickly cause big problems as a weed eater will cut through the fiberglass over time. Once that happens, it becomes hard to prevent freezing and causes the heater to use more electricity. The equipment inside is also much more vulnerable to weather, people, and critters. The tensile strength of most fiberglass enclosures is about 10,000 psi. Fiberglass buildings are susceptible to ultraviolet light deterioration. Over time, the fibers weaken and can eventually deteriorate. The typical UV protection shield many manufacturers add to their products only acts as a temporary safeguard against the inevitable fiber blooming. This sometimes means holes in the enclosure so it needs to be patched or replaced. Fiberglass is tough to modify and machine. Because of this, you're usually limited to only the models the manufacturer makes available. It is especially difficult to add holes or cutouts because the fiberglass is likely to chip or crack. It is also dangerous to cut, because the fine dust that occurs is abrasive to both skin and lungs. Don't forget it's fiberglass. 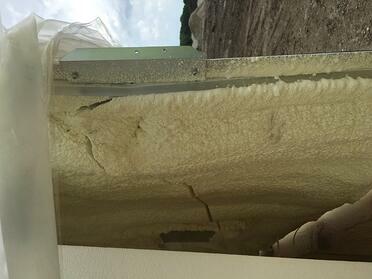 Often, fiberglass shelters rely on spray foam insulation. These pictures are an example of what can happen to the sprayed insulation. 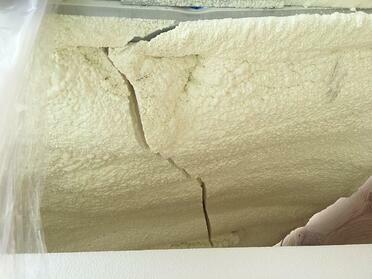 It can crack and fall off the structure, and when that happens, the enclosure isn’t insulated in that area. In fact, sometimes the enclosure itself and its insulation crack even in transit to the job site. Fiberglass manufacturers often ship their products assembled. That means they cannot be shipped in a flat box and the freight charges will be more expensive than other solutions.